The dual-payload mission required the most capable version of ULA’s Atlas 5 rocket, a hot-rod launcher with five solid-fueled strap-on motors to add an extra boost during the fiery liftoff at 7:13 p.m. EDT (2313 GMT) from Cape Canaveral’s Complex 41 launch pad. Riding 2.6 million pounds of thrust, the Atlas 5 surpassed the speed of sound in less than 30 seconds as it arced toward the east over the Atlantic Ocean, leaving an exhaust plume in its wake contorted by a column of upper level winds. The five solid rocket boosters, built by Aerojet Rocketdyne, dropped away just shy of the mission’s two-minute point, and the Atlas 5’s Russian-made RD-180 main engine continued chugging a mix of kerosene and liquid oxygen for four-and-a-half minutes. The Atlas 5’s bronze first stage dropped away, leaving the Centaur upper stage’s RL10C-1 engine to ignite for the first of three maneuvers to initially reach a parking orbit, then raise its altitude to deploy the mission’s two main payloads high above the equator. The rocket was programmed to deploy the Air Force’s Continuous Broadcast Augmenting SATCOM, or CBAS, satellite first. The CBAS satellite — pronounced “sea bass” — is a military communications relay station designed to keep commanders in contact with senior government leaders, according to the Air Force. CBAS rode in the forward, or upper, position inside the Atlas 5 rocket’s payload shroud. 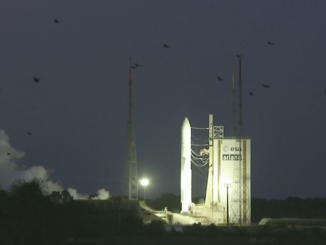 Another satellite, an experimental multi-payload carrier known by the acronym EAGLE, was fastened below the CBAS spacecraft during launch, and was expected to separate from the Centaur upper stage second. The Atlas 5’s guidance computer aimed for a circular orbit roughly 24,200 miles (39,000 kilometers) over the equator, slightly above the geostationary orbit region populated by numerous telecom, reconnaissance and early warning satellite. The rocket reached its intended orbit after commanding the Centaur stage’s RL10 engine on a six-hour flight to the mission’s target altitude, with the final upper stage burn nulling out the payload’s orbital inclination to 0 degrees. 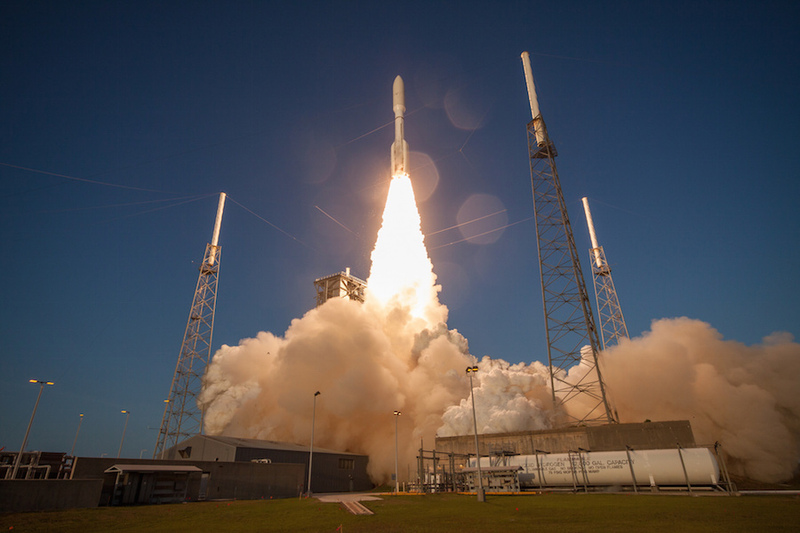 The long-duration mission, the first such direct Atlas 5 flight to a near-geostationary orbit disclosed by ULA, kept officials awake into early Sunday, Florida time, to confirm a successful conclusion to the launch. 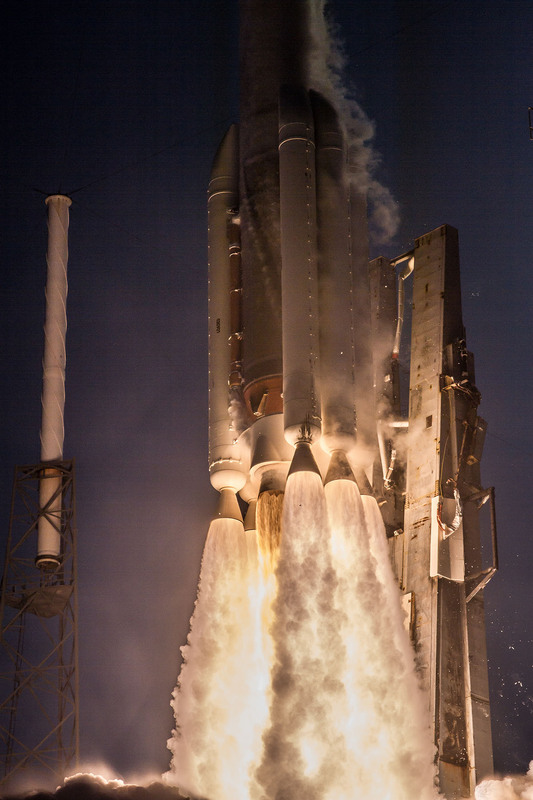 ULA declared success shortly after 2 a.m. EDT (0600 GMT) Sunday in a press release, wrapping up the 77th flight of an Atlas 5 rocket since its debut in August 2002. 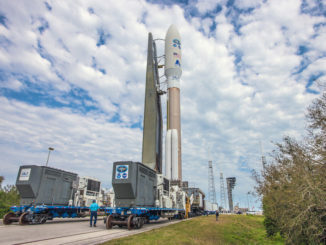 Saturday’s launch for the Air Force was codenamed AFSPC 11, and many details about the payloads aboard the rocket remained secret until the final days before liftoff. The Air Force kept the identity of the main payload on the launch secret until April 6, when officials revealed the CBAS satellite’s communications relay function. 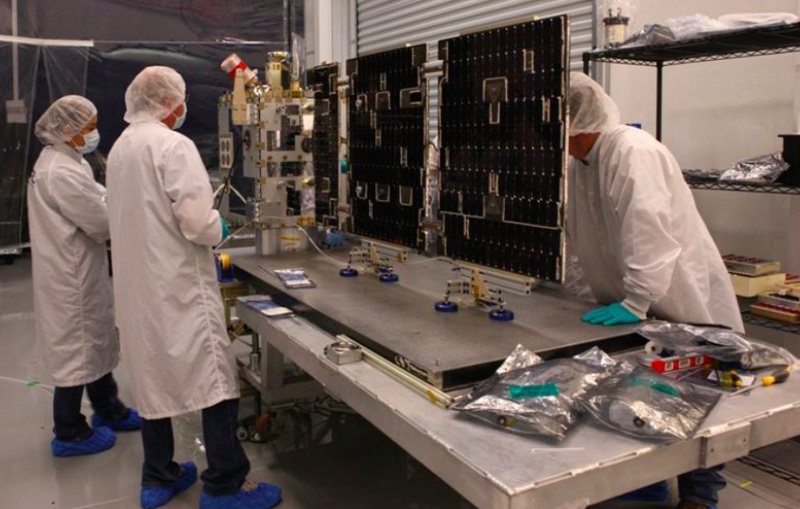 An Air Force spokesperson declined to identify the contractor that built the CBAS satellite, and the military released no further details on the mission. The lower passenger is the Evolved Expendable Launch Vehicle (EELV) Secondary Payload Adapter (ESPA) Augmented Geosynchronous Laboratory Experiment satellite. The Air Force calls the nested acronym EAGLE for short. Orbital ATK developed the EAGLE spacecraft by modifying a ring-like structure often used to connect small satellites to their launchers, adding solar panels, computers, rocket thrusters and instrumentation to the adapter. The Air Force says EAGLE will a pathfinder for future missions, demonstrating a maneuverable satellite design that could help the military launch new capabilities at less cost. Managed by the Air Force Research Laboratory’s space vehicles directorate at Kirtland Air Force Base, New Mexico, the EAGLE mission “hosts experiments designed to detect, identify, and attribute threatening behavior as well as enhance space situational awareness,” the Air Force said in a statement. One of the experiments is a separating daughter satellite named Mycroft, apparently named for the older brother of the fictional detective Sherlock Holmes. In one of Sir Arthur Conan Doyle’s short stories, Sherlock Holmes says Mycroft possesses observational and deductive abilities greater than his own. The Air Force describes Mycroft as a “fourth-generation space situational awareness experiment.” The service said the satellite will test technology that could be used by future missions to survey, catalog and inspect objects in geostationary orbit. The Mycroft satellite, also built by Orbital ATK, “will explore ways to enhance space object characterization and navigation capabilities, it will investigate control mechansms used for flight safety, and it will explore the designs and data processing methods for enhancing space situational awareness,” the Air Force wrote in a fact sheet on the mission. Mycroft is a follow-up to the Air Force’s ANGELS satellite, which launched into an orbit just above the geostationary belt in 2014 and ended its mission in November. ANGELS inspected the upper stage of its Delta 4 rocket soon after launch, then tested in-orbit surveillance, navigation and rendezvous operations for the rest of its mission. According to the Air Force fact sheet, Mycroft will fly to a distance of around 21 miles (35 kilometers) from EAGLE, then re-approach the mother satellite to a range of about a kilometer, or 3,300 feet. Mycroft will evaluate the region around the EAGLE satellite with an on-board camera, the Air Force said, and use its sensors and software to perform advanced guidance, navigation and control functions. The Air Force said engineers have completed “rigorous research and development” to ensure Mycroft can safely fly through the congested geostationary orbit region. Mycroft weighs a few hundred pounds, and its main body is no bigger than a mini-refrigerator, with a deployable solar panel out the side. The Air Force owns four operational satellite sleuths in Geosynchronous Space Situational Awareness Program. The GSSAP satellites flying around the same region as Mycroft and ANGELS more than 22,000 miles over the equator, feeding data on numerous foreign and commercial spacecraft movements positions to military officials. The EAGLE satellite is scheduled to operate at least one year, and the Mycroft mission is expected to last 12 to 18 months, the Air Force said. The Air Force will also use the EAGLE mission as a training tool for engineers and satellite controllers. Another experiment on EAGLE will evaluate the performance of a “hypertemporal” imager that combines data in infrared, ultraviolet and visible light, a capability the Air Force says will allow analysts to extract more information from image scenes. Two more separable payloads are also abroad the EAGLE satellite, according to information provided during ULA’s launch webcast. No details about their missions were released. The next Atlas 5 mission is set for May 5 from Vandenberg Air Force Base, California, with NASA’s InSight lander heading for Mars. 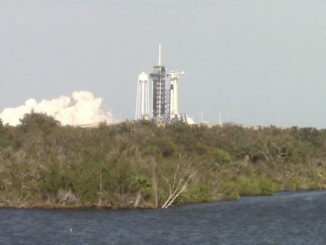 Another launch from Cape Canaveral is scheduled for Monday evening, when a SpaceX Falcon 9 rocket will loft NASA’s Transiting Exoplanet Survey satellite, an orbiting observatory that will search for planets around other stars.